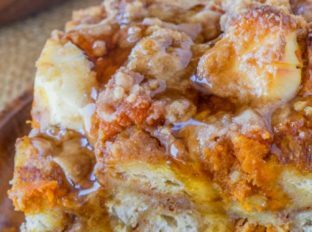 Pumpkin French Toast Bake with cream cheese filling and no overnight chilling and is the perfect brunch recipe that’s part french toast, part cheesecake. 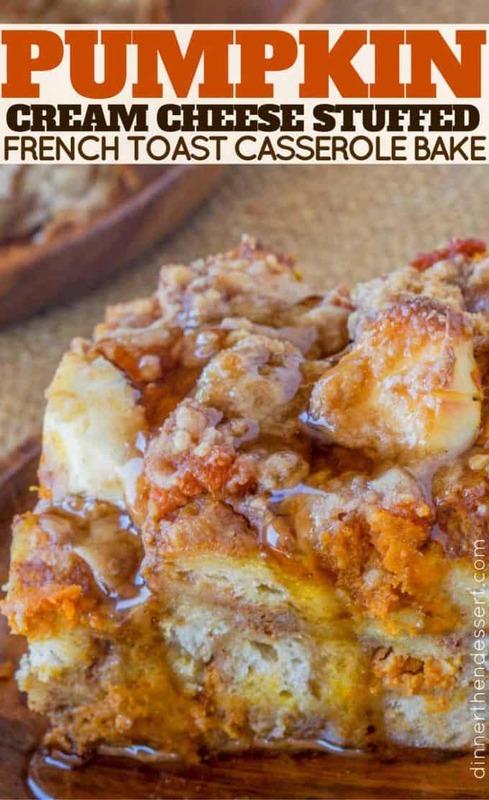 Pumpkin French Toast Bake is like the perfect hybrid of french toast, cheesecake (ooohh even like a cheese danish since the cream cheese isn’t sweetened). It is officially all things pumpkin in the house and I’m loving every second of it. The fall baking season is here and I went to my local pumpkin farm and bought a half dozen of the most amazing sugar pumpkins to make pumpkin purée (coming tomorrow). Those pumpkin left me with almost 200 ounces of purée (I freeze them in 15 ounce batches so it is easy to use it in recipes that call for canned pumpkin). Some people like to call french toast bakes different names like french toast casserole or overnight french toast. 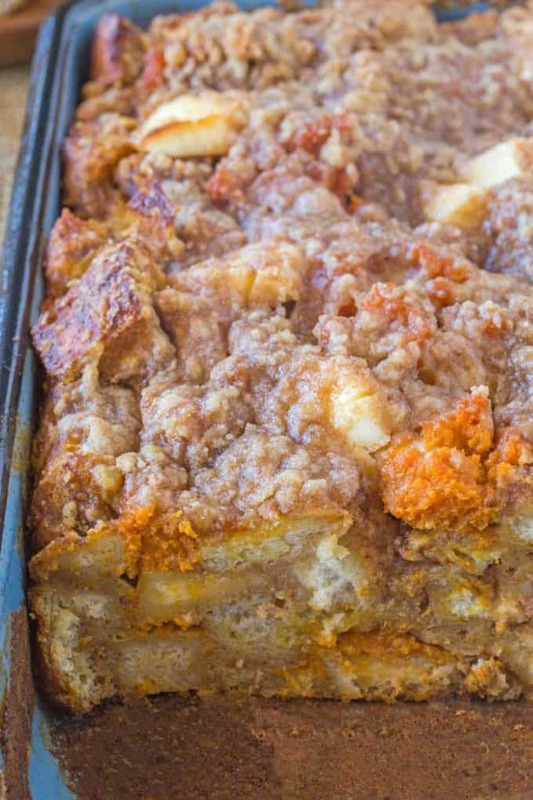 This is a fall flavored pumpkin take on my favorite brunch recipe, Easy French Toast Bake. Looking for more baked pumpkin recipes? 9×13 Baking Pan: The perfect baking pan, it has high sides and bakes evenly. Plus when you cut into it you get picture perfect squares. Maple Syrup: Love serving this with real maple syrup. I keep this brand and Trader Joe’s brand (buy that in store, it is 1/3 the price) on hand at all times if I can. Nutmeg: The only way I use Nutmeg is with whole nuts. The flavor is completely different than the pre-ground variety and adds another dimension to baked goods. 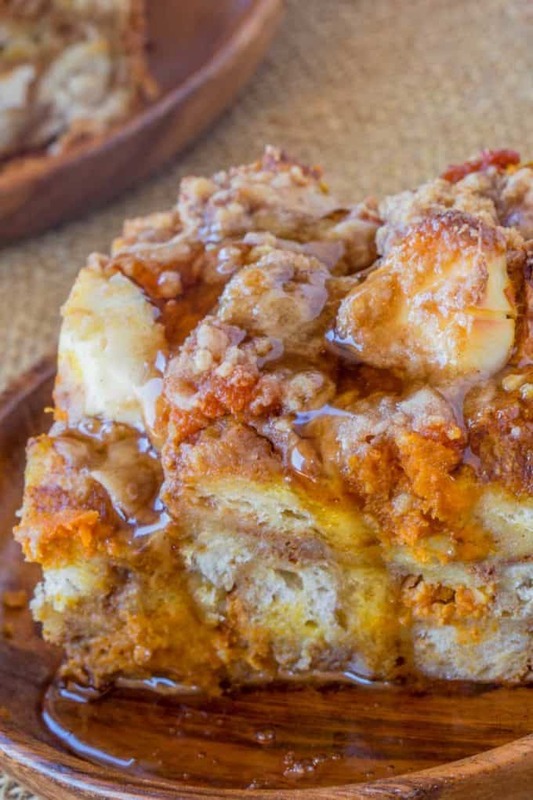 Pumpkin French Toast Bake with cream cheese filling and no overnight chilling and is the perfect brunch recipe that's part french toast, part cheesecake. Spray a 9x13 pan with cooking spray and preheat your oven to 350 degrees. In a large bowl, add the eggs, milk, pumpkin puree, heavy cream, sugar, 1/2 cup brown sugar, vanilla, cinnamon, cloves and nutmeg. Chop the bread into 3/4 - 1 inch cubes and put it in the bowl with the egg mixture and toss well until all the liquid is absorbed. In a small bowl or a food processor add the flour, brown sugar, cinnamon, and salt and mix. Cut in the butter with a fork or pulse in the food processor for 5-10 seconds or until the butter and brown sugar mixture is crumbly. Pour half the bread and egg mixture into the pan, dot in half of the cream cheese chunks, add the remaining mixture and then add the rest of the cream cheese chunks. 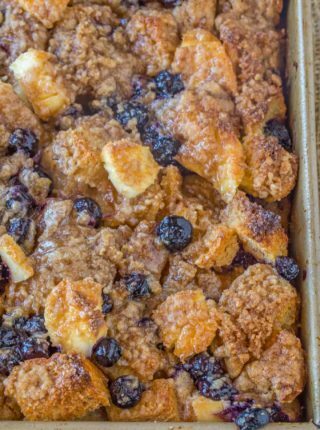 Cover evenly with the brown sugar-butter topping and bake for 45-50 minutes or until the top is crispy and the center is no longer wet. This is EXACTLY what I want on fall weekends!! This looks like a great way to start every morning! My boys would devour this! It’s definitely a family favorite here too! This looks like the perfect Fall breakfast! This is the reason fall is my favorite. I can not get enough pumpkin. Just curious about the cream cheese that is in the title, but not in the recipe. Thank you! I edited it show correctly now. This pumpkin recipe looks great but I don’t see cream cheese in the recipe. How much and when is cream cheese added? I would love to make this for an ‘anything pumpkin’ loving friend. Thank you so much for letting me know it was missing. Not quite sure how that got left out but I revised the recipe card to show so hopefully that sticks. Am I missing something…no cream cheese in the recipe? Thanks for catching that! I edited it but you’ll want to add 8 oz of cream cheese to this recipe. I also updated the instructions to walk you through where to add it in at. So sorry. I love pumpkin season! 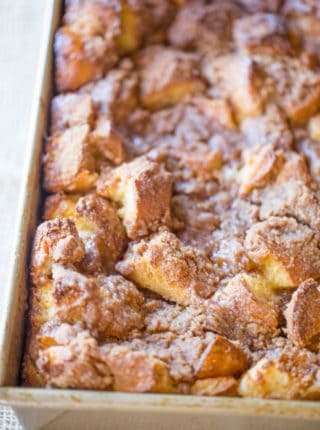 Your french toast bake look great! 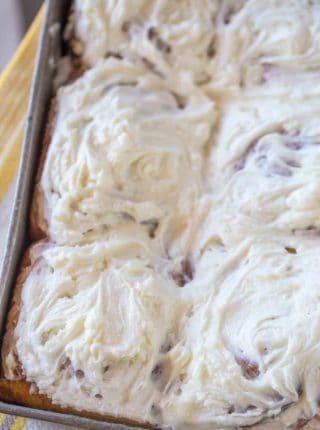 Where is the cream cheese in this recipe? I’m so sorry about that. I’m not sure it there was a glitch or if it was a case of needing more coffee before posting. I edited it to show correctly now. 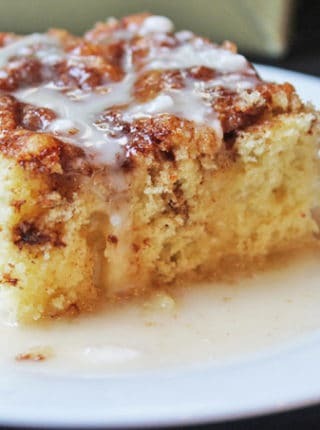 I will definitely be making this during the fall!! I think a good brunch is the perfect excuse to eat some sinful and delicious like this dish!